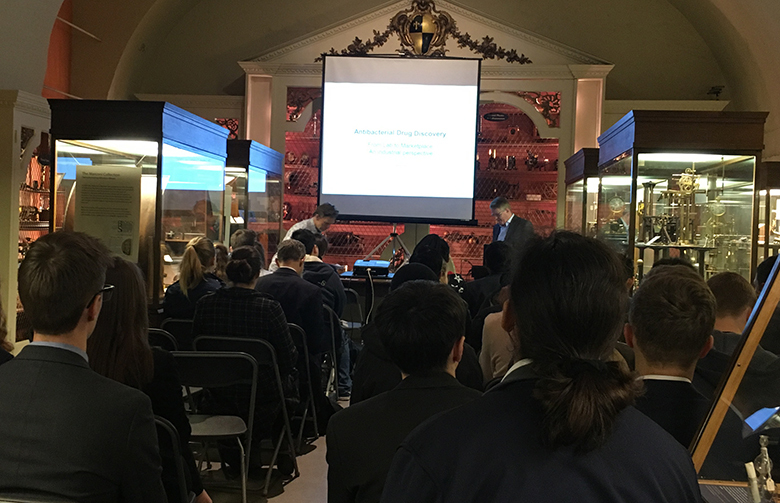 Biology students at The Sixth Form College, Solihull visited the Oxford Museum of the History of Science last week for a Key Stage 5 study day. A group of first year A level Biology students went on the trip to attend an exhibition on the theme “Back From The Dead”, concerning the extraordinary story of the development of penicillin in wartime Oxford, the rise of antimicrobial resistance in modern medicine, and the challenge to scientific research. The students listen to two talks from academics at the University of Oxford: ‘Penicillins remain the most important antibiotics’ by Professor Chris Schofield the Head of Organic Chemistry and ‘Why is antibiotic resistance such a big challenge?’ By Professor Angela Brueggemann from the Nuffield Department of Medicine. There was then a talk from Dr Czaplewski of Chemical Biology Ventures Ltd on ‘From Lab to Marketplace: An Industry Perspective’. These talks allowed students to see how their A Level Biology studies relate to the issues surrounding antibiotic resistance, as well as how working in industry and academia can help contribute to the solution. In the afternoon, students took part in some practical sessions run by current students at the University of Oxford, delving deeper into the science behind antibiotics and how studying the Biosciences at university can lead in many directions. Finally the students were given a guided tour around the ‘Back from the Dead’ exhibition. The exhibition showed how penicillin wasn’t all about Alexander Fleming and the roles of the male and female scientists who were involved with the identification, synthesis, mass production and testing of penicillin.